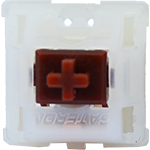 Similar in feel to Cherry MX Browns, Gateron is Cherry Clone with a feel that more than holds its own with Cherry. Gotta admit, these feel much better to type on than Cherry MX Clears because of the less tactile feedback, making them better for gaming as well. Have experience using Gateron Brown switches? Add a review to share your knowledge with the keyboard community.